I got the tutorial from craftster, via angry chicken blog, for using freezer paper to make stencils for fabric painting. 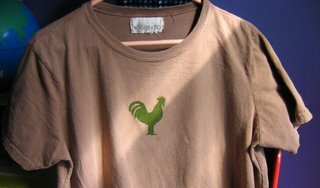 The rooster is just some clip art I found online. I used a maternity shirt for my test project (I'll be finished with all my maternity clothes for good in just a few weeks!!!) and I'm pretty pleased. It was pretty easy to do (of course, a more complex design would be harder to execute) and I've got some ideas for future projects. I'll have lots of time for crafting in the next two weeks, as Finch has shown a few little signs of wanting to get himself out into the world a bit early. Since I'm just over 35 weeks along, my midwife wants me to take it easy for the next two weeks at least to discourage him. It's kind of nice to be obliged to rest! Reading, crafting, and writing are even more fun without the guilt and "I shoulds" (do the laundry, vacuum the floors, walk the kids to the library, etc).